I have somehow ended up on my husband's jet lag sleep schedule. I don't have jet lag. And yet I slept for ten hours last night and didn't wake up until 11:00 this morning! I was supposed to get out and mow the lawn before the heat of the day. Fat chance of that happening. Well, I suppose that just means I spend my morning (what's left of it) writing. I am in a pretty unintensive class right now, so I actually have writing time again, whoo-hoo! I will be so glad when school is done. Just a handful of classes left. 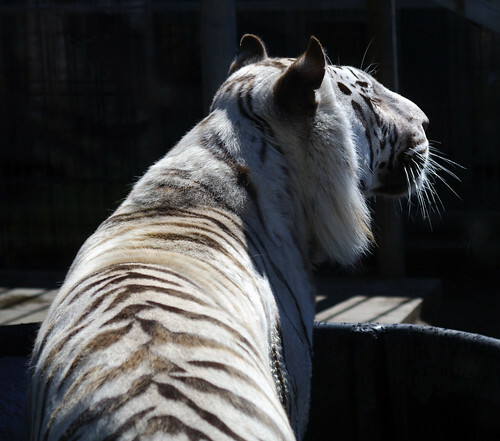 So, I finished uploading the tiger photos. You can see them all at my flickr page, but here's a sampling. 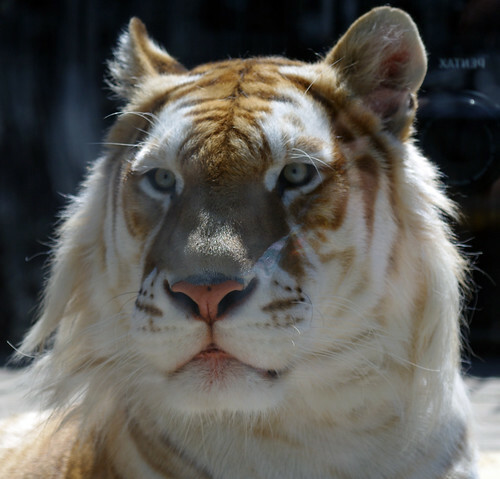 Taj the golden tiger is still my favorite, but Almos was very active and gave a great story to tell. So here we are, at the Cougar Mountain Zoo in the Tiger Tunnel. It's a pretty lazy summer day. 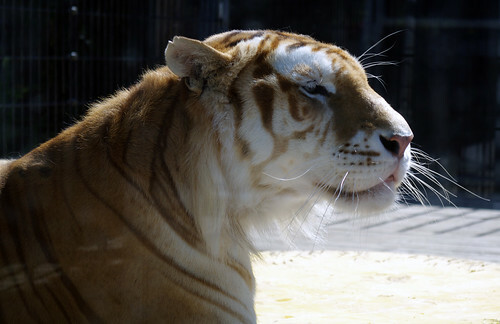 The golden tiger, Taj, is enjoying the sun. Meanwhile, Almos is interested in playing in his pool. 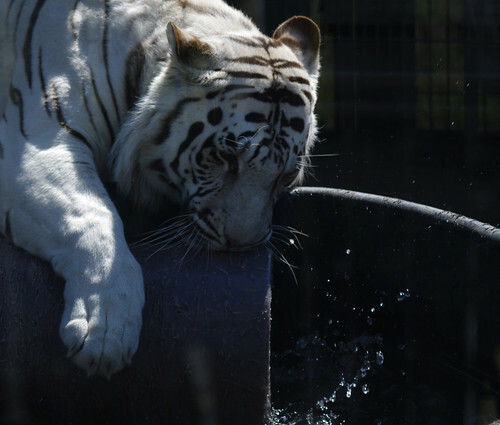 Tigers love water. They and Jaguars are the only big cats that do. Almos gets in and plays. Taj lays in the sun. Here, you can see the telltale tiger ear spots. Taj thinks maybe that looks good....but not good enough to get up. An interloper in the habitat above! 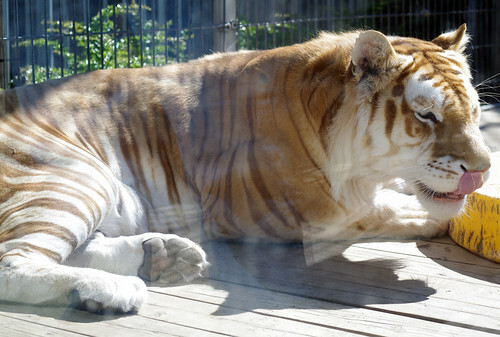 Bagheera is a traditional bengal tiger, orange and black, and he would like to challenge for dominance. 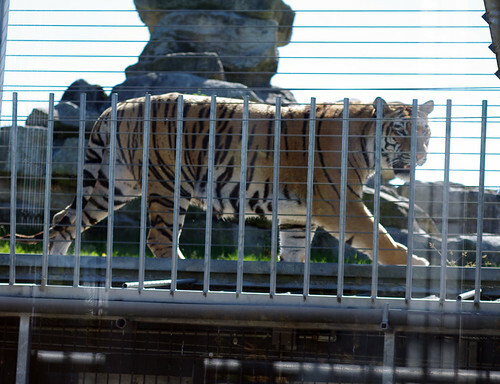 He is also the largest of the four tigers at the zoo, but the keeper with us seemed very confident in Taj's ability to win. Though smaller, Taj is fierce. 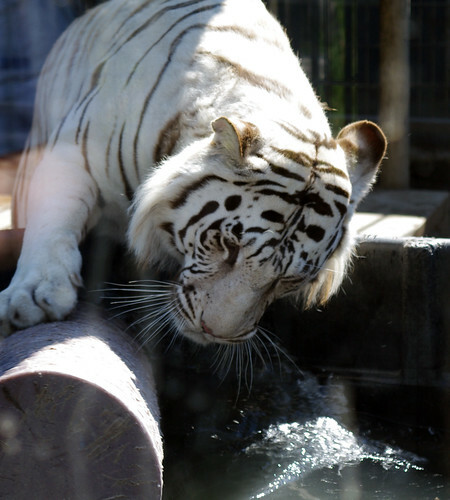 And Bagheera was scared of the water pool when they set it up this year, even though he's seen is in previous years. 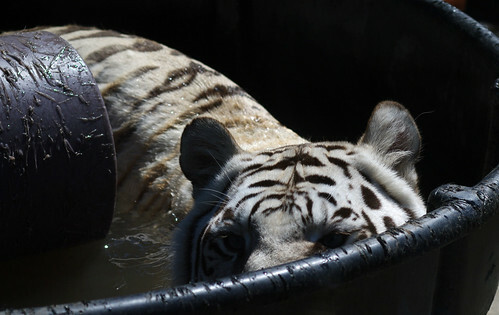 Almos sinks down into the water, and becomes "stalking cat". Taj is aware, but not concerned enough to move away from his spot in the sun. In the end, Almos goes back to his water. And Taj continues to look majestic. This is my favorite picture. His green eyes are so pretty. You can see my camera reflected in the glass in the upper right corner. 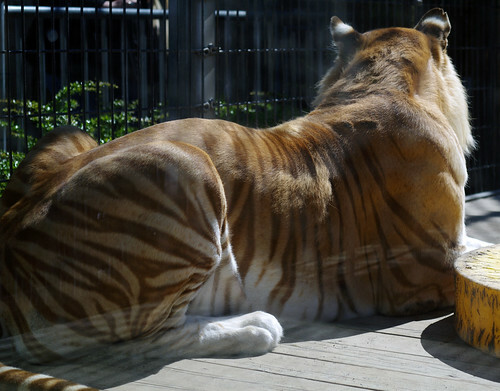 Tigers are very close to being extinct. There are only something like 4800 left in the wild, because of poachers. (I'm not 100% on the number, but it was small like that. In the four digits.) 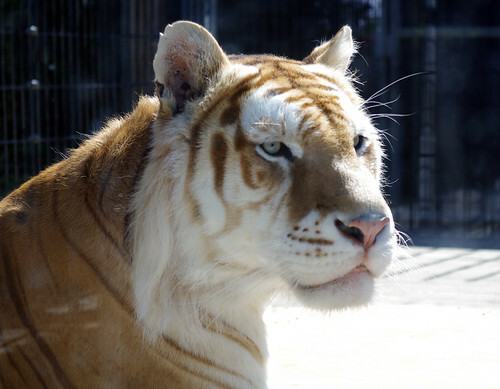 If things continue as they have been, these majestic cats will be gone in another ten years. 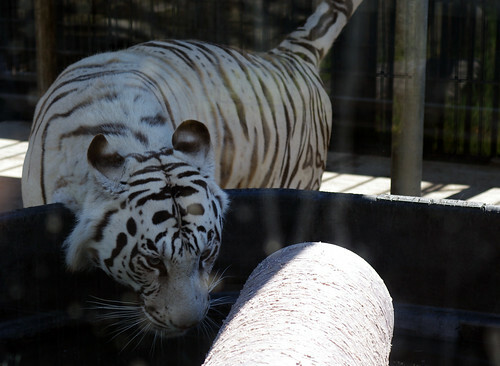 At the Cougar Mountain Zoo, they have four tigers that were born into captivity, all male, because their goal isn't to breed more tigers into captivity. It's to educate about the plight of their wild brethren, and help promote conservation. The four cats are in pairs of two, each group having grown up together. 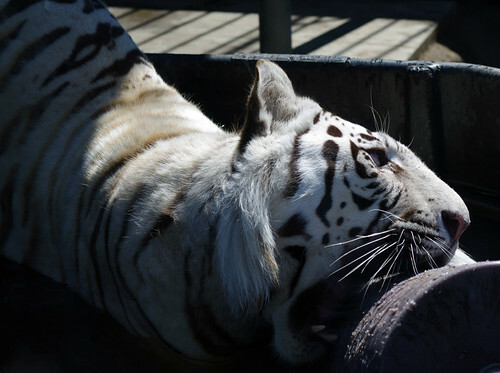 It was the zoo's goal to introduce them together, but the territorial displays they've seen (like the one depicted above) show that introducing the two sets would very likely end up in a fight for dominance. The zoo can't take that risk, because they can't just wade in and try to stop it if that happens. 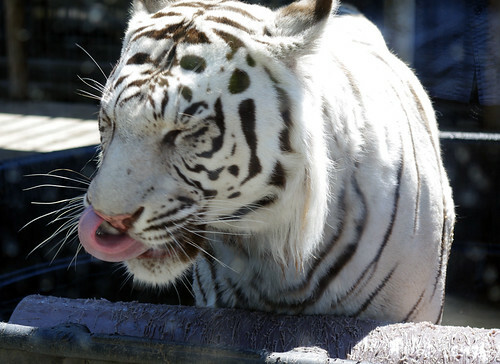 They don't want to risk losing one or more of their tigers, so it looks very likely that both pairs - Taj and Almos, and Bagheera and Vitez (another white tiger) - will have to continue as they have, taking turns sharing the exhibit and the larger habitat. If you'd like to see more (or larger versions) of these picture, you can go here to my flickr account.